Our toe kick registers are offered in 3 hard to find sizes and are made from a durable steel. 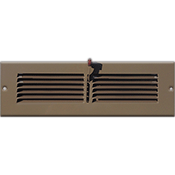 This brown vent is the perfect fit for tight spaces such as under your kitchen cabinets. The toe kick register has a louvered damper which is controlled by you to open or close off the air distribution into your room. Our brown vent also features a contemporary, straight look to the faceplate for simplicity's sake. Order your toe kick register based off the hole opening measurements in your wall or kickboard. Once you receive your brown vent in the mail, installing it will be easy! On the toe kick registers faceplate are two pre drilled screw holes for mounted onto your wall. Screws come included with the purchase. Our brown vents are made in the US and are your practical and affordable option when it comes to any remodeling project. Tip: When ordering your brown vent, make sure to take the measurement of your wall hole opening. The 14 x 3 toe kick register will fit into a hole which measures 14 inches wide by 3 inches high. The brown vent faceplate will measure larger than this. If this toe kick register is too simple, check out our custom wooden grilles or our urban aluminum grilles to satisfy your decor. Functional brown vents never looked so good at such a low cost! Order today and have them shipped to your door.